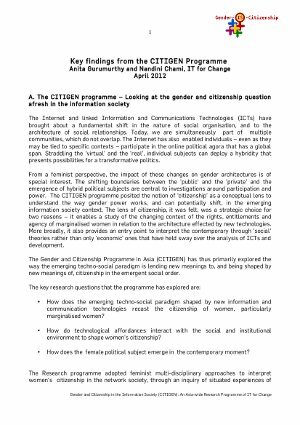 IT for Change has entered into an agreement with Zubaan, a leading feminist publishing house in India, to bring out a book – 'Feminist Visions of the Network Society' – that consolidates key insights from the various research efforts undertaken as part of its 'Gender and Citizenship in the information society' (CITIGEN-Asia) programme. The book is planned as an edited volume of 14 essays which will specifically explore how modes of agency and active citizenship are re-cast in the network society context, in which the increasing fluidity of the boundaries between the 'online' and the 'off-line' leads to the emergence of new spaces for political action. The book is expected to be published in early 2014. For more details, see the concept note and the book of abstracts. 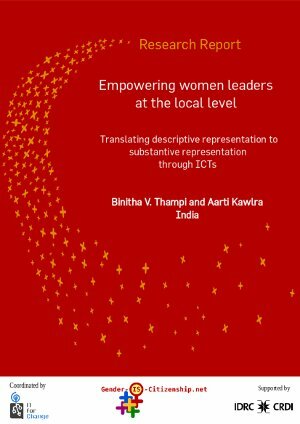 The project 'Empowering Women Leaders at the Local Level: Translating Descriptive Representation to Substantive Representation through ICTs' explores the creation of a new technologically mediated ‘invented space’ for women’s empowerment for revitalising ‘invited spaces’ of governance and to enable their active civic and political engagement at the local level in Kerala, India. It seeks the possibility of building solidarity across differences among women through the creation of Gramamukya, a digital platform, as a ‘communication community’ within the emerging transnational public sphere. This feminist action research project attempts to provide a platform, through an online magazine, for the experiences, needs, desires and analysis of marginalised women, men and youth in the Philippines, within the theme of sexual and reproductive health services and rights. The project aimed to influence lawmakers both directly and through public opinion by bringing forth stories and accounts of those community members most in need of sexual and reproductive health services and rights (SRHR), and that this increased voice and visibility could possibly lead into the passing of a reproductive health law. Learn more about the project. This study explores the dynamics of the emergence of multiple counter and alternative public spheres in Hong Kong and Guangzhou, two distinctive Chinese societies under the regimes of post-colonialism and authoritarianism. The research examines the uses of new media and technologies among different social agents - women's organisations and activists - in community building and campaigns for social justice. 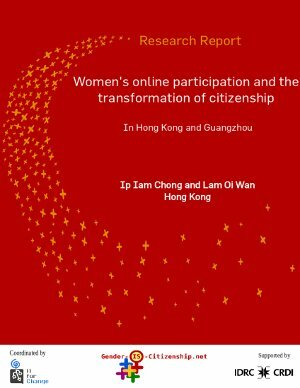 This research examines closely the appropriation of the Internet technology by women from different social positions. With attention to the political dynamics and structures, it attempts to reflect upon and re-strategise feminist practice in engaging with local politics through new media. Research paper from the Sri Lanka research project. Learn more about the project. Research paper from the Hong Kong - Taiwan research project. Learn more about the project. This website was developed by IT for Change. All content (except where explicitly stated) is licensed under a Creative Commons Attribution-NonCommercial 3.0 License which makes it available for wide-scale, free, non-commercial reproduction and translation. This website is best viewed using Firefox Internet browser.